Air Transat looks to have dropped their late March and April 2012 flights to Fort Lauderdale down to levels that are 45% cheaper than any other airlines. 2. 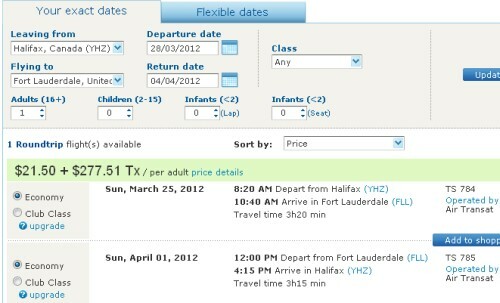 Search for Halifax (YHZ) to Fort Lauderdale (FLL), departing in late March or April. Sunday to Sunday dates are what you should try. Also, it only seems to work with 1 week trips. 3. After you search, hit flexible dates. Makes it easier. halifax, yhz, united states, flight deals, florida, air transat, fort lauderdale and fll.